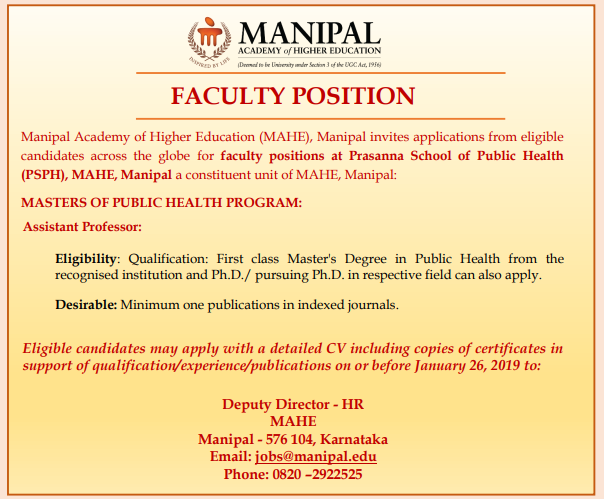 Manipal Academy of Higher Education (MAHE), Manipal has advertised for recruitment of Assistant Professor jobs vacancies. Interested and eligible job aspirants are requested to apply on or before 26th January 2019. Check out further more details below. About University: Manipal Academy of Higher Education, formerly known as Manipal University, is a private research institute deemed to be university located in the university town of Manipal, Udupi, Karnataka, India. Manipal Academy of Higher Education has branch campuses in Dubai and Mangalore. support of qualification/experience/publications on or before January 26, 2019 to the postal address or email address given below.